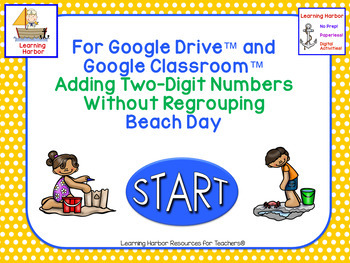 This is a Beach Kids Theme math activity to use with Google Classroom™ or Google Drive™! Students will practice adding two-digit numbers without regrouping with this self correcting, interactive Google Classroom™ activity. Students will click on a symbol on the home page and be taken to a random slide with a two-digit addition problem. Students will find the answer to the problem, record their answer, and check their work by touching or clicking their answer. 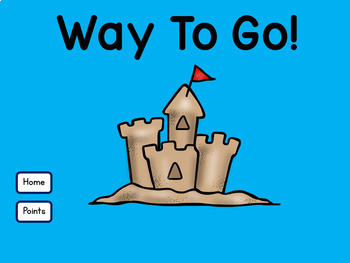 If the student clicks on a correct answer, a slide with “Way to Go!” will pop up. If the student clicks on an incorrect answer a slide with “Try Again, You’ll Get It Next Time” will pop up. Students can tally correct answers on the tally slide projected on an interactive white board, if you wish or you can copy the black and white points slide for students to use. A bonus is included with this resource. A word search with 12 words is found near the bottom of directions. How will using Interactive Self-Correcting Google Slides™ activities benefit you and your students? They are paperless and no prep! Just download and teach. They work on any computer or device that operates Google Slides™. They are engaging so students spend more time on task. They improve students' dexterity and computer skills.